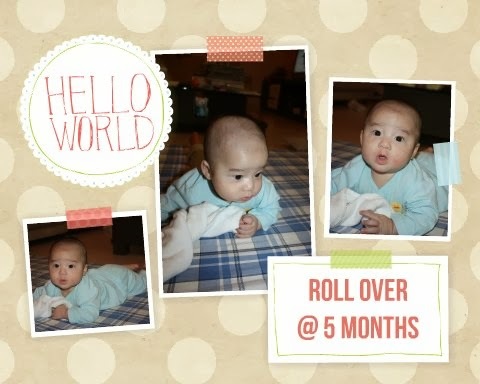 Little Wai boy finally rolled over on the 25th of October 2013, exactly 5 months and 2 days old. It was on a Friday morning and as usual, Mommy would placed this little fella on a mattress to do some 'free & easy' style of 'kick-boxing' on the floor while busy preparing his brother, Kit boy for school before feeding him milk and sending him off to nanny's house later after his brother left for school. But on this particular morning, Mommy was so excited to see our little Wai boy finally rolled over lying on his tummy steadily and happily staring at us despite at a totally different view. I was ecstatic and immediately placed him back lying faced up again hoping that he will do it again. VOILA.... just in a mere few seconds, he did it again and this time round Mommy managed to capture this memorable moment with her phone.